Algae for biofuel: OMEGA project has success in California, ready to scale up. A NASA-backed experiment harvests algae for oil, releases fresh water. All algae produce natural oils. We may just need to harness the right ones for an energy source. Before we run out of fossil oil, we will thoroughly tap the sea floor, find and frack wells wherever they may be, and excavate and extract the most recalcitrant of oil shales. In so doing, we will fuel our lifestyle for a few more decades at the cost of releasing vast amounts of carbon dioxide, adding to global warming, melting ice caps, raising sea levels, acidifying oceans—and setting course for a future for which there are few optimistic scenarios. In the face of all this, scientists are racing to find alternatives. Biofuels are my passion, but they have had rather a bad press, from complaints about displacing food production to the inefficiency of soybeans and the carbon footprint of ethanol. Microalgae have a low profile but they deserve a much higher one, since the fossil oil we mine mostly comes from microalgae that lived in shallow seas millions of years ago—and they may be key to developing sustainable alternative fuels. Algae are single-celled organisms that thrive globally in aqueous environments and convert CO2 into carbohydrates, protein, and natural oils. For some species, as much as 70 percent of their dry weight is made up of natural oils. Through transesterification (the process of adding three molecules of alcohol to one molecule of natural oil), the algae oils can be transformed into renewable fuels. 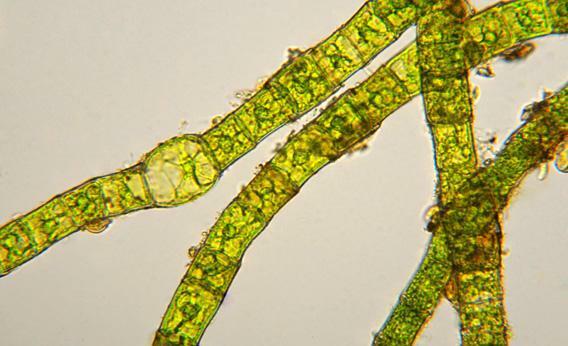 Microalgae hold great promise because some species are among the fastest growing plants alive and are therefore one of the best sources of biomass, while other species have been estimated to produce between 18,700 and 46,750 liters of oil per hectare per year, nearly a hundred times more than soybeans’$2 468 liters per hectare per year. But there are big unsolved problems at which governments should be throwing funds and brainpower as if we were involved in a Manhattan project. For example, since few species of microalgae have been domesticated, we don’t know how to grow them reproducibly or economically. At what scale will algae farming be efficient? To put this in perspective, U.S. planes use 80 billion liters of fuel per year. To supply this fuel from microalgae at the lower end of the estimated production rate would take 4.2 million hectares—twice the area of Wales. Luckily, there may be a good way to cultivate this much algae while solving the ethical problem of producing biofuel without competing with agriculture. Freshwater algae can be grown in wastewater (effectively, water with fertilizer), or marine algae can be grown in a blend of seawater and wastewater. In both cases, wastewater provides a growth medium and the algae clean the wastewater by removing nutrients and pollutants from it. So there’s no competition for fresh water needed elsewhere, no reliance on synthetic fertilizer, and the environment benefits. The United Nations estimates that the world produces around 1,500 cubic kilometers of wastewater annually, of which more than 80 percent is untreated. This means there is an ample supply of nutrient-rich water for the algae, while algae treatment is available to offset the environmental impact of wastewater. There remains the question of how and where to grow the algae. A few species are cultivated commercially on a small scale, in shallow channels called raceways or in enclosures called photobioreactors (PBRs). Raceways are relatively inexpensive, but need flat land, have lower yields than PBRs and problems with contamination and water loss from evaporation. PBRs have no problems with contamination or evaporation, but algae need light, and where there is light, there is heat: A sealed PBR will cook, rather than grow, algae. And mixing, circulating, and cleaning problems send costs sky high. Assuming we can fix this, the question of siting remains. In order not to compete with agriculture, PBRs must use nonarable land reasonably close to a wastewater treatment plant. But in most cities, wastewater plants are surrounded by infrastructure, so installing PBRs on thousands of hectares around the plants would affect roads, buildings, and bridges—again driving up costs prohibitively. A solution occurred to me: For coastal cities, we should try a system I call OMEGA: Offshore Membrane Enclosures for Growing Algae. Some 40 to 60 percent of Earth’s population lives near a coast, most of the biggest cities are near a coast, and nearly all coastal cities discharge wastewater offshore. How does OMEGA work? It uses PBRs made from cheap, flexible plastic tubes floating offshore, and filled with wastewater, to grow freshwater, oil-producing algae. It would be easier to build the systems in protected bays, but breakwaters could also be constructed to control waves and strong currents. The water need not be deep or navigable, but a few things are crucial, including temperature, light, water clarity, frequency and severity of storms, boat traffic, nature and wildlife conservation. Beyond solving the problem of proximity to wastewater plants, there are other advantages to being offshore. OMEGA uses buoyancy, which can be easily manipulated, to move the system up and down, influencing exposure to surface waves and adjusting light levels. And the overheating problem is eliminated by the heat capacity of the surrounding seawater. The salt gradient between seawater and wastewater can also be exploited to drive forward osmosis. Using a semipermeable membrane, which allows water, but not salt, pollutants, or algae to pass through, wastewater is drawn into the saltwater with no added energy. In the process, algae are concentrated in preparation for harvesting and the wastewater is cleaned, first by the algae, and then by forward osmosis. This produces water clean enough to release into the marine environment or recover for reuse. If OMEGA’s freshwater algae are accidently released, they die in seawater, so no invasive species can escape into the ecosystem. In fact, OMEGA can improve conditions by providing a large surface for seaweed and invertebrates to colonize: part floating reef, part floating wetland. Then there are the extra possibilities of developing wind or wave power and aquaculture, growing food such as mussels. OK, if it’s so good, where is it? For the past two years, backed by NASA and the California Energy Commission, and about $11 million, we have crawled over every aspect of OMEGA. In Santa Cruz, Calif., we built and tested small-scale PBRs in seawater tanks. We studied OMEGA processing wastewater in San Francisco, and we investigated biofouling and the impact on marine life at the Moss Landing Marine Laboratories in Monterey Bay. I’m now pretty confident we can deal with the biological, engineering, and environmental issues. So will it fly economically? Of the options we tested, the OMEGA system combined with renewable energy sources—wind, solar, and wave technologies—and aquaculture looks most promising. Now with funds running out and NASA keen to spin off OMEGA, we need the right half-hectare site for a scaled-up demonstration. While there is enthusiasm and great potential sites in places ranging from Saudi Arabia to New Zealand, Australia to Norway, Guantanamo Bay to South Korea, as yet no one has committed to the first ocean deployment. We could be on the threshold of a crucial transition in human history—from hunting and gathering our energy to growing it sustainably. But that means getting serious about every option, from alpha to OMEGA.